It’s tomato time! Well…almost. Today we got a nice, lovely blast from the Arctic, with winds up to 35 mph and 32 degrees tonight. I am NOT happy about it, but oh well. 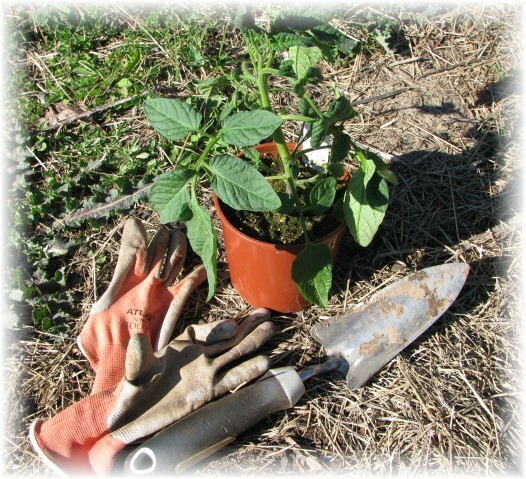 So gather up your gloves (my new fave: nitrile treated microfiber gloves made by Atlas ~ $6), your trowel, and your ‘mater plants. Well, as usual, I’m getting ahead of myself. When you go to buy your little plants, always read the tag. The tags give you all of the pertinent information. In this case, you will see the description, followed by the word ‘determinate’. Tomatoes come in 2 main varieties. Determinate and indeterminate. A determinate tomato is a plant which is more like a bush. It will make fruit and after you harvest, it’s productive life is over. An indeterminate tomato is a vine. The plants can get absolutely monstrous, but it will continue to produce until it gets too hot to set fruit (when nighttime temps get above 70 degrees, you can pretty much forget fruit on MOST tomatoes), or until frost. 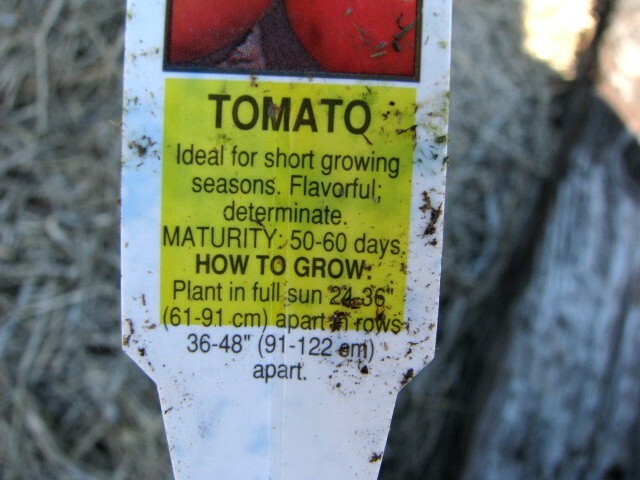 For example, I set out Roma tomatoes and Brandywines last spring. 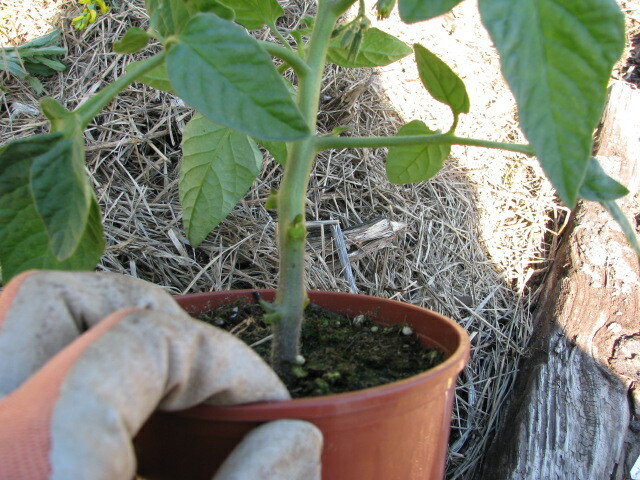 The Romas are determinate, they made a nice, big bush and produced well in early summer. Brandywines are indeterminate, and had a trailing form, with lots of fruit in both the early summer, AND in fall. I decided to leave the Romas in through the fall to experiment, and though it produced a beautiful plant, I got the ugliest, tiniest tomatoes come fall. And about 4 of them at that. Anyway, so now you know the difference. I prefer the indeterminate types myself since I like to plant once! Next, this tag gives you the maturity date. That is, from the time you put the plant in the ground until you are able to harvest the fruit. This is very important! It also gives you recommended sun exposure times (full sun is like 8-12 hours a day), and how far apart to set out plants. 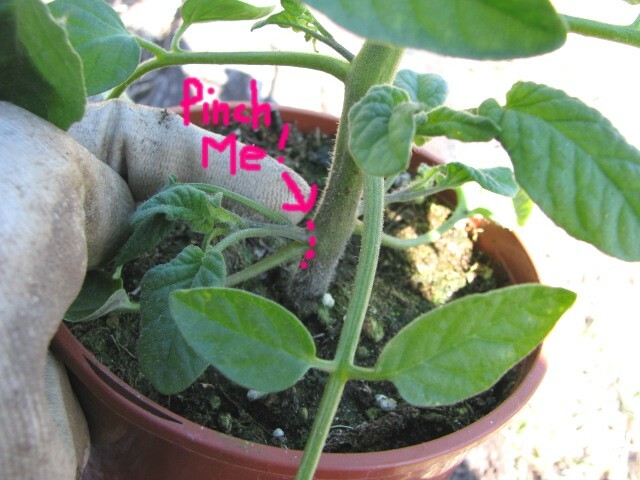 Before you remove the plant from the pot, remember this….on most tomato transplants, especially ‘leggy’ plants, you will want to remove the few sets of leaves closest to the soil. Then, when it is planted, roots will form on this stem that you have created, and it will strengthen the plant and help it to be more stable and upright. I just pinch ’em off with my thumb and forefinger. 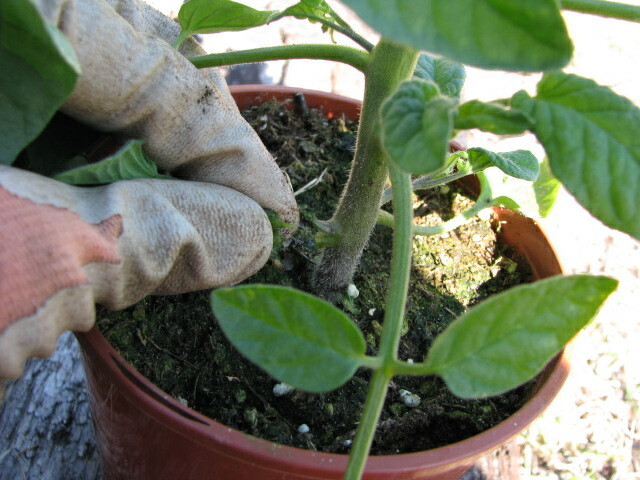 On this plant, it wasn’t really too leggy, so I only removed 2 lower sets of leaves. Here you can see what I pinched off. Here is the plant removed from the pot. You can see that the roots are good and healthy and not too crowded (rootbound). Ideally, you will not want to start with rootbound plants. 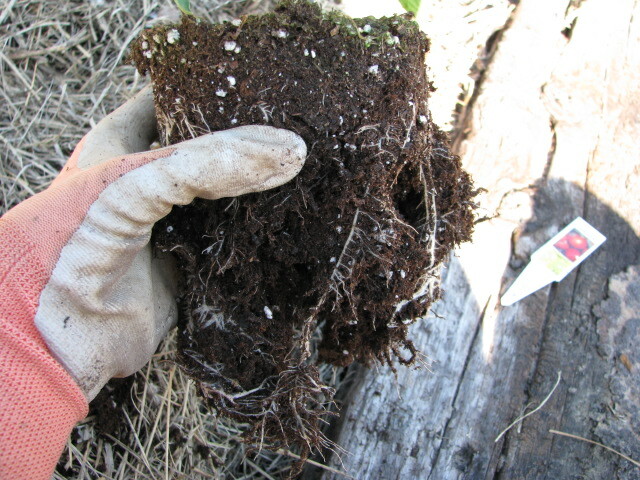 On all plants that I plant, I always break up the soil gently and work out the roots just a bit. 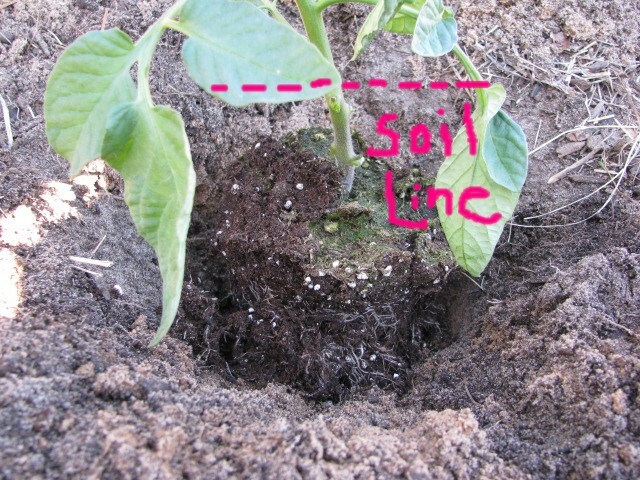 On really rootbound plants, I will actually take a knife, whack off the very bottom of the whole thing, and cut an ‘X’ on the bottom and along the sides of the rootball. This isn’t the case here, so i just teased the roots a bit, being careful not to damage them. 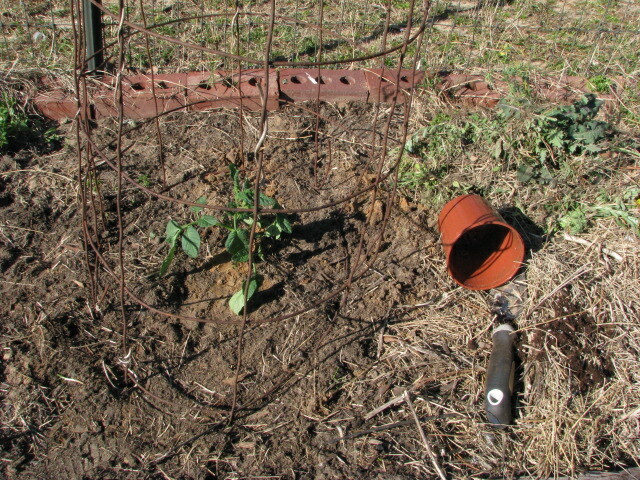 Now, I set the plant in a hole which is a bit wider than the rootball, and deep enough to cover those removed leaf scars I have just made on the stem. You can see that my soil is pretty sandy stuff, but it’s got a whole bunch of compost added into it actually. Kindof hard to make out in this photo. So now you will fill back in your soil, packing it gently to remove any large air gaps. I also did something that I have done previously for some transplanted roses. I took the pot that the tomato was in and buried it next to the plant, up to the lip of the pot. When it is watering time, I fill up the little pot a couple of times and in this way I know that the water is actually reaching the roots. You can also use soda bottles with the tops cut off, just poke some holes in the bottom before burying it. This worked really well for the roses, especially in the drought of summer. Honestly, I had pretty much forgotten that I had done that, and then I saw an ad for something similar for an orchard, and thought, “Aha!”. I’ll just use my ingenious mind to come up with something cheap. Lol. Now set your tomato cage over your baby plant and you’re ready to go. Sorry that this pic is out of sequence! Anyway, the cage will help support the plant. As it grows, I use old cut up pantyhose to tie the growing plant to the cage to help support the heavy branches as the fruits develop. Pantyhose won’t cut into the plant and they are super stretchy to boot. This cage was made from ‘all stock’ fencing, and they are really easy to make. Water your plant well, and keep the soil well watered (read: not dry, but not soggy) for a week or two while the roots develop. Yes, you can kill a plant with kindness. I probably water mine every other day until the plant starts showing new growth. I have sandy, well draining soil, so honestly the possibility of me drowning my plants is slim to none, but if you have really clay-ey soil, you have to be a lot more cautious. Then again, that’s really something to deal with BEFORE you plant! I have to admit I am no expert on fertilizing and last year, I probably threw out some 13-13-13 around the plants a time or two as they were growing, but who knows? I have had great success just using straight compost and not worrying about fertilizers. This year, though I am using organic fish emulsion which STINKS, but so far it seems to have been working well on my baby tomatoes I am growing.